Micromax Unite 2 A106 was a quick response to the Moto E which made a runaway victory in the entry level segment just like the Moto G. But with a quad-core processor, 1 GB RAM, running Android KitKat with a far better camera, the Unite 2 has become more of its competition than a hasty response. We ran benchmarks, did some gaming and also tested the camera of the Unite 2 and came out impressed. But is it better than the Moto E and preferable over other phones in the segment? 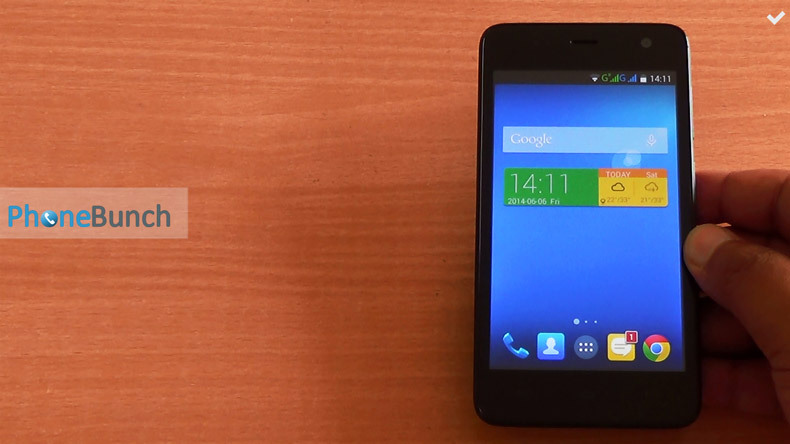 That's the question we are going to answer in our Full Review of the Micromax Unite 2 A106. The Micromax Unite 2 A106 comes with a 4.7-inch WVGA (480x800 Pixels, 199 PPI) IPS display, 1.3 GHz quad-core MediaTek MT6582M chipset with Mali-400MP2 GPU with 1 GB RAM running Android 4.4.2 KitKat right out of the box. There's 4 GB internal storage out of which 0.89 GB is available as Phone Storage and 1.67 GB as internal storage. There's a 5 MP auto-focus camera at the back alongwith a bright LED flash and a 2 MP front-facing camera. The Unite 2 A106 too is a dual-SIM, dual-standby device and uses one regular, one micro SIM card slots. You also get global roaming on GSM. 3G connectivity is available on both SIM slots but only one SIM card can use the network at a time. Rounding up the connectivity options we have Bluetooth 4.0, WiFi b/g/n with support for WPA security, WiFi Direct, FM Radio and GPS. You also have an accelerometer, proximity and light sensors available on the phone. There is a magnetic field sensor but its disabled. For a look at the various accessories that you get the Micromax Unite 2 A106, have a look at its unboxing. In the front of the Unite 2 A106 you have a bright 4.7-inch IPS display. It has a brighter display than the Moto E. Just below the display you have three backlit capacitive buttons for menu, home and back. The back-lighting is a bit weak, and you won't notice much difference whether its on or off until you are in the dark. But we would have liked them to be on-screen, it would have helped reduce bezel sizes, plus they provide a more unified Android experience. The capacitive buttons, however, are sharp and there's no visible light-bleed. At the top of the display there's the 2 MP front-facing camera, proximity and light sensor as well as a notification LED to the left of the earpiece. At the top, there's the 3.5 mm audio jack and the microUSB data-syncing/charging port. The microphone as well as the space to open the back-cover can be found at the bottom. On the right you can find both the volume rocker as well as the power lock/unlock button. Both are dark-blue in color, tastefully designed and are sturdy without any wobble. But they are a bit mushy, soft and don't offer good feedback. Being on the same side, both buttons are reachable with your thumb, making single-handed operation easy. On the left there just an expanse of matte plastic. The 5 MP auto-focus camera can be found at the back, with the LED flash just below it. There is no secondary noise cancellation microphone. The speakerphone is at the bottom with its grill raised a bit, but that doesn't prevent sound from getting muffled. The back has a matte finish similar to Canvas 2 Colours and looks neat. The sides of the phone are rounded making the phone fit easily in your hands with more grip provided by the matte finish. On opening the back-cover you will find a regular SIM card slot and a micro-SIM card slot right next to it. To the side you have the microSD card slot capable of taking in 32 GB of storage. The battery compartment is just below the SIM slots to house the 2000 mAh unit. The back-cover closes in shut giving the device a unibody look as it envelopes the sides, all the while reaching towards the top of the front panel. The sides of the front-panel are glossy and raised a bit to protect the phone from coming in contact with a flat surface. Overall the build of the device is sturdy, there's no flex or creaking anywhere. The Unite 2 feels good to hold in the hand and is easy to grip. There's a 4.7-inch IPS display but with a low WVGA resolution which makes gaming graphics and some text look a bit pixelated. But it has good color reproduction and excellent viewing angles. The display is quite bright and has good sunlight visibility. You also get DayDream and lockscreen notifications in display settings, the Unite 2 A106 also has a light sensor, so Auto brightness is available. The touch-response is good and we didn't see any refresh-rate issues, ghosting or freezing. Call quality is good and the earpiece is quite loud. The speakerphone too doesn't crackle at full volume on call. The other person on the line could hear us clearly as well. Network reception is good, WiFi reception is average. GPS and Navigation work fine, it is able to triangulate location within seconds. You have the new Android smart dialer which comes with KitKat. Some users have been asking whether WPA networks are supported, in a word, yes. There is no issue with WiFi connectivity, Wifi hotspots, USB and Bluetooth tethering. There's a 5 MP auto-focus rear camera with a bright LED flash alongwith a 2 MP front-facing camera. The flash is actually quite helpful at night especially if you are taking an image of a close subject. The camera interface is pretty similar to any MediaTek based smartphone and you get HDR mode, a new Live Photo mode, panorama shot as well as beauty shot. You can an in-depth look in our camera review. The camera on the Unite 2 A106 is actually quite good, it takes sharp images with good, natural color reproduction. Macro shots also turn out quite well, auto-focusing is fast. Unite 2 has a far better camera than the Moto E, quite literally there is no comparison between the two. Videos do turn out a bit blurry, but it is capable of recording 1080p videos. You can record in 720p to get a bit more clarity. Here are some image samples taken with the 5 MP camera of the Micromax Unite 2 A106, you can see more image samples in our Google+ Albums. Here are the two 1080p video samples with Electronic Image Stabilization On and Off. EIS does have a little effect in stabilizing a shaky video. The speakerphone on the Micromax Unite 2 A106 is loud, clear although deficient when it comes to reproducing low-frequency tones. Sound is a bit tinny, but it doesn't rattle or crackle at full volume. But it does get muffled when the phone is placed on its back. Music playback is good, high-bitrate content plays well. You have an equalizer available as well, and it is quite effective. The headset available with the phone is quite useless for listening to music but its good enough for voice calls. But sound quality from the headphone jack is quite good, you should get a pair of good headphones and you would enjoy a good listening experience. There is no distortion or noise added to the headset output. The speakerphone is loud and clear, it doesn't crackle at full volume. FM Radio reception is also quite clear, you also get stereo FM playback and recording. The Micromax Unite 2 is able to play 1080p videos without any lag, frame-drop or issues. There is no ghosting in video playback as well. YouTube playback is smooth as well, there are no sync issues. At present you can play only upto HQ or 480p videos, but a new update to the YouTube app is coming which would allow you to choose quality upto 720p. Unite 2 comes with the Reverie smartpad which supports 20 Indian regional languages including Hindi, English, Gujarati, Tamil, Telugu, Malayalam, Bengali, Nepali among others. You can long tap on the space-bar of the Reverie keyboard and choose the language option you want. But this Keyboard always opens-up in uppercase characters, which is a bit bothersome when you want to enter a password. Your messages will be sent in that language. However, the entire OS still remains in English, its just messaging, emails and anywhere you can use a keyboard where the regional language input becomes an additional benefit. Unite 2 A106 runs Android 4.4.2 KitKat right out of the box. Its launcher looks like the Google Now launcher available on the Nexus devices, but it doesn't have "OK, Google" hotword detection on the home-screen. The app and widget drawers have been separated. The launcher does crash sometimes, if you face that issue just install NOVA launcher or another from the Play Store. You can access the app-drawer, normally as you used to from the center icon of the launcher and the widget drawer can be accessed by long tapping on the home-screen and choosing widgets or by pressing the menu button and doing the same. The multitasking UI or recent apps can be accessed by long tapping on the menu button while long tapping on the home button opens up Google Now, which too works well. Not many apps come pre-installed, you just have the basic Google apps and some useless apps/games from Micromax. You do have the Reverie Keyboard and Phonebook which offer multi-language support. But that's just it. Its an almost stock Android experience. We tested web-browsing on Google Chrome and as expected, the experience was smooth. Rendering is fast, text re-flows quickly as well when scrolling. Pinch-to-zoom also works smoothly. Touch response remained excellent throughout our test. There were no rendering issues with the websites we tried. Text does look a bit pixelated when you zoom in closer. You get 0.89 GB phone storage and 1.67 GB is available as internal storage. The phone storage where the apps are installed first, and some portion of the app remains as well does get filled up quickly. So you have to keep that in mind even though app and app-data are movable to the SD card. USB OTG is supported by the chipset, but there is some software glitch which prevents the USB device from being mounted. This can be fixed with an OTA update, but as of now USB OTG does not work on the Micromax Unite 2. You get Voice and Face unlock on the Unite 2 which do work well. Pattern, Pin and Password are available as security options as well. Android Device Manager is also available using which you can ring, erase and find your phone if its lost. You also have two new options available in security, Auto-Start management and App Permissions. Auto-start management allows you to see which apps are able to start when the device first boots up and through app-permissions you can control which app is able to access which hardware or software feature available on your device. Say Facebook wants to access you camera, so you will get a popup asking you whether you want to let Facebook use your camera, where you can either deny, allow or always allow without prompt. But it should be kept in mind that some apps do crash when certain permissions necessary for their operation are disabled. Gaming was excellent on the Unite 2, there was no lag in the high-end games. Apps and app-data is movable to the SD card so you can install the high-end games as well. Graphics did look a bit pixelated in some of the games but rendering was generally smooth. We didn't have any issues with touch response, ghosting, freezing or even frame-drops. The Unite 2 does get a bit hot while playing games or heavy usage but not in general use. For the price you get excellent performance, there is no lag in general use, apps open up quickly, touch response is fast and multitasking is a breeze. KitKat has been optimized for lower memory devices, therefore 1 GB RAM is sufficient to run even demanding games without a hiccup. Battery life is again quite good on the Micromax Unite 2, you can easily get one and a half days worth of mixed usage with the phone including some light gaming, music & video playback, calls and web-browsing. The Micromax Unite 2 is the challenge Moto E needed before becoming the undisputed leader of the entry-level segment. The Unite 2 was launched with Android 4.4.2 KitKat for Rs. 6999, same as the Moto E, but since then both devices have been plagued with stock issues. Unite 2 is now available somewhere between Rs. 7500 and Rs. 8000, but even then it comes with a good camera, build and performance. Gaming is again something where the Unite 2 is better than the Moto E simply because app-data is movable to the SD card. Moto E still sits at the throne due its features like Corning Gorilla Glass 3 protection, water resistant coating and a sharper qHD display. But the Unite 2 comes quite close with a better camera making it a suitable competition.